Following a series of new openings for 2015, this summer visitors to Lisbon have more choice than ever before for a drink with a view. Featuring stunning vistas, signature cocktails and chill-out vibes, the city's hotels open up their top floors to anyone looking to make the most of a relaxing summer evening – whether you are looking for a 'Sunset Party', want to cool off in an infinity pool (or a open air Jacuzzi! ), have a late drink at 2am or simply chill out in an intimate rooftop garden. Below are some of the most memorable spots in the Portuguese capital for a drink with that 'extra touch of Lisbon'. Deck 7 is the rooftop lounge bar that crowns Porto Bay Liberdade, the latest five-star hotel to open in Lisbon (February 2015). Located close to Avenida da Liberdade, the city's premier shopping destination and home to some of the world's most prestigious luxury brands, you can take in the views as you enjoy your drink on the wooden deck – or from the rooftop Jacuzzi! The recently opened H10 Duque de Loule (March 2015), decorated by celebrated Spanish interior designer Lázaro Rosa-Violán, takes hospitality to new heights in central Lisbon. Limao, its 'chill-out terrace', is located on the hotel's tenth floor, combining an elegant open-air space with stunning views across the city and the Tagus Estuary, especially at sunset. If you are looking for the best infinity pool with views in Lisbon look no further. UpScale, the rooftop bar on the ninth floor of five-star Epic Sana Lisboa Hotel, features lush lounge beds, breathtaking vistas and a growing menu of popular fruity cocktails. While here try its signature drink, the exotic 'UpScale Colada', made with rum, pineapple juice and coconut ice cream. Watching the sunset from the rooftop bar of Hotel Mundial is a must, which is why every summer the hotel organises regular 'Sunset Parties' with resident DJs at the panoramic lounge of its ninth floor. Featuring a relaxed atmosphere and modern ambience, prepare yourself for jaw-dropping views over one of Lisbon's most famous must-sees, the Sao Jorge Castle. Skyna Hotels is the first Angolan chain to go global, with Lisbon chosen as the location of its first international property, launched in March 2015. 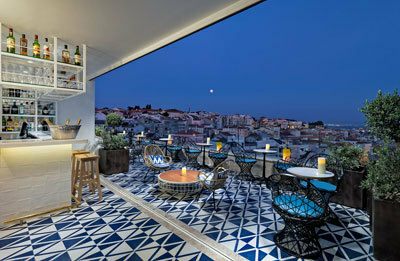 Vicius Lounge Bar, the hotel's intimate, 60-seat rooftop garden, is located on the sixth floor and is open daily from midday to midnight, offering memorable views over Lisbon. This is the place to come if you want a really late drink, combined with some of the best night-time views in Lisbon. Varanda do Castelo, located on the top floor of the five-star Vintage Lisboa Hotel, is open until 2am offering a relaxed environment, chill-out vibes, scrumptious Portuguese tapas and dazzling vistas over some of the city's most popular landmarks. The multi-award winning, five-star boutique Bairro Alto Hotel opened in 2005 and a decade later it is still impossible to find a hotel in this part of the city that can claim better views! Famous with locals and a compulsory stop for visitors, it is the perfect spot for lunch during shopping, a thirst quenching afternoon cocktail or a candlelit drink in a relaxed atmosphere. Direct flights to Lisbon operate from London, Manchester, Liverpool, Edinburgh and Bristol with TAP Portugal, British Airways, easyJet and Ryanair. For more information visiting Lisbon please go to visitlisboa.com.